I was North and made 3S with a little help from my friends for 26 of 34 matchpoints. Systemically, we open 1C with 5-5 black hands. We got to absolute par by saving over 4H. Do you agree with 4S by me? West, understandably, took the push to 5H with his 6-5. +200 was worth 32 of 34 matchpoints. OK, here's some problem hands for you to chew on. Feel free to share your answers and read others' opinions by clicking on the word "Comments" at the end of this article. I'll also tell what happened at the table in that section. LHO (a solid citizen) opens 3S; pard doubles; RHO passes. Your call. RHO opens 1C. You're up. You open 1D in third seat. LHO bounces to 4H, and partner makes a negative double. Your bid. (D) How should these hands be bid at all white? South starts, and East bids (or doubles) hearts at her first opportunity. Basically, one of a major has been raised to two, and there has been a pass after the 2H or 2S bid. There could have been prior bids by one or both partners, and there could have been interference (or even an opening bid) from the opponents... but the important thing is, one of a major has been raised to two. Standard practice in this situation is the "help-suit game try" -- when the one of a major bidder has enough above a minimum that he wants to investigate game but not enough to just up and bid four of the suit (I'll call that player 1M for short) bids a new suit where he has some losers that need to be taken care of. In response to this, his partner (we'll call him 2M) can bid game if the "help suit" is well covered (with high cards or shortness), return to three of the major if the "help suit" is not at all covered, or bid three of another suit that he has "stuff" in when he's not sure if his holding in the "help suit" is enough for a game bid. With hand (a), your lousy five-count has turned to gold. Partner will lose a club but then trump any further club losers in the dummy. Bid 4H! With hand (b), you still have a lousy five-count. You can't do anything about partner's club losers, and he probably has some spade-diamond losers as well. Bid 3H and hope he makes it. With hand (c), you have a good raise to 2H, but that alone shouldn't make you bid game. You have some help in clubs, but not enough to go straight to game yourself. Here you should bid 3D. This tells partner, "Yes, I do have some help in clubs, but not enough to be sure of game. I do have some nice stuff in the diamond suit, too--- maybe that information will help you make the right decision." Many years ago, some players turned the game try system on its head-- they bid the suit where they didn't want their partner to have high cards -- their singletons! This is called the short-suit game try. Partner will tend to bid game with no wasted values in that suit -- something like three small is a great holding here -- and sign off in three of the major when he has wasted high cards in that suit. Which works better, help-suit or short-suit game tries? If I had to pick, I guess I'd say short-suit, but thankfully, I don't have to choose between them. Eric Kokish came up with what he called two-way game tries. This structure has held up very well over the several years that I've been playing it. 2NT = asks partner where he would accept a help-suit game try. 3C = short-suit game try. 3D = short-suit game try. 3H = short-suit game try. When 1M relays with 2NT (asking for a help suit), 2M will bid the cheapest suit in which he would accept a help-suit game try. So if 2M has QT6 J84 KQ632 86, he'll bid 3D over 2NT. This not only tells partner about that diamond help, but since 3C was skipped over, 1M knows that 2M has a poor club holding. 1S - 2S; 2N [asking] - 3C [stuff in clubs]; 3D [do you have stuff in diamonds?] - 3H [Not really, but I have some goodies in hearts! ]; - 4S. It gets just a bit trickier for a lot of folks when hearts are trumps. If we were to use 2NT as the "help-suit ask" over 2H, there would be no way to show spade help-- so we use 2S as the asking bid. 2S = asks partner where he would accept a help-suit game try. 2NT = short-suit game try in spades. One more little space-saving maneuver: When partner asks with 2S, to show spade help we bid 2NT. So if the auction goes 1H -2H -2S [asking] - 3C [stuff in clubs], 2M has denied help in spades (the "cheapest" suit). So there's Kokish's two-way game tries. Astute readers may have noticed the title of this post was three-way game tries. What's the third way? We use the re-raise (1H - 2H - 3H or 1S - 2S - 3S) as trump asks. If we've opened a 16-count with Jxxxx of spades, after partner's raise we certainly don't want to be in game if partner has a medium hand with Txx of spades. SO we make the trump-ask of 3S. Pard will pass with Txx but bid game with KQx or AT9x. can occur. How about that -- 10 HCP opposite 16, we take our nine tricks in 3NT when the rest of the field is losing three trump tricks and an ace in 4S. Go team! and the auction went 1S (X) 2S (P) to me. I bid the "trump ask" of 3S knowing full well pard wouldn't bid 4S. It was a slight risk that he would bid 3NT, but knowing my LHO had a big hand it seemed that the tactical bid was the percentage action. I turned out to be right (for once) -- lefty had enough values to take another bid over 2S but not over 3S. Down two, -100, against lots of -170s and -620s their way. three of the major asks for good trumps. Tinker and I played the gthe Klamath Falls club the other day. We had a good time, with remarkably few mixups for a first-time partnership. We had a 61% game for first overall. All problems matchpoints; click the word "Comments" at the end of the post to put in your two cents, see what we did at the table, and see what others would have done! RHO opens 1S. You pass, LHO raises to 2S, and partner bids 3H. Righty passes. Do you bid? You pass in first chair. LHO opens a 'could be short' 1D, passed around to you. You double, and pard advances with 1H. Should you raise to 2H with this? Say you pass. LHO bids 2D, pass, pass, you now bid 2H, and lefty bids 3D, checked around to you again! What's your call here? Your right-hand opponent passes in first seat, and it's your bid. LHO opens 1S, pard passes, and RHO bids two non-game-forcing clubs. Do you have a call? Would it make a difference if it was a GF 2C call? Yesterday I wrote about the Laws of Auction Bridge from 1912. I shared some of the wacky rules that ran the game 96 years ago. At the end of those Laws, there's an Etiquette section. This is very well done, and I'd like to share the first seven Rules of Etiquette. Modern bridge players could do well to take this to heart. In Auction Bridge slight intimations convey much information. A code is compiled for the purpose of succinctly stating laws and for fixing penalties for an offense. To offend against etiquette is far more serious than to offend against a law; for, while in the latter case the offender is subject to the prescribed penalties, in the former his adversaries have no redress. Declarations should be made in a simple manner, thus: "One Heart," "One No-trump," or "I pass," or "I double"; they should be made orally and not by gesture. Aside from a legitimate declaration, a player should not give any indication by word or gesture as to the nature of his hand, or as to his pleasure or displeasure at a play, a bid, or a double. If a player demand that the cards be placed, he should do so for his own information and not to call his partner's attention to any card or play. No player, other than declarer, should lead until the preceding trick is turned and quitted; nor, after having led a winning card, should he draw another from his hand before his partner has played to the current trick. A player should not play a card with such emphasis as to draw attention to it. Nor should he detach one card from his hand and subsequently play another. A player should not purposely incur a penalty because he is willing to pay it, nor should he make a second revoke to conceal a first. Players should avoid discussion and refrain from talking during the play, as it may be annoying to players at the table oro to those at other tables in the room. Since this is Auction Bridge, you are given game and slam bonuses for making the right amount of tricks no matter how high you bid... one club making six still gives you the slam bonus. There are two ways to bid spades-- Spades, and Royal Spades or "Royals", Royals scoring more. 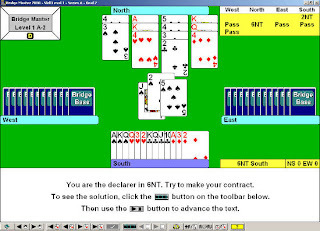 To make game, you need 30 points "below the line"; No Trumps count for 10 per trick, Royals 9 per trick, Hearts 8 per trick, Diamonds 7 per trick, Clubs 6 per trick, and Spades 2 per trick. All this extra math means is you still need 3NT, 4M, or 5m to make the game bonus. You can never make a game in Spades. If your opponents revoke, giving you your 12th or 13th trick, you do not receive the slam bonus. The dealer cannot pass! If the dealer had a bad hand, he would bid One Spade (remember, this counts only 2 points per trick). The worst you can do in 1S is -100. To bid more than the current bid, you have to bid something worth at least as much in trick value. So if your RHO bid 3NT, you couldn't bid 4C -- you'd have to bid five! If you bid or double out of turn, either opponent can demand a new deal. When declarer revokes, the defenders automatically get 150 points. When the defenders revoke, declarer can take 150 points or take three tricks from the defenders. The revoking side cannot score (except for honors, of course). We came in second in the annual Klamath Falls Unit Fall Open Pairs on Sunday. The event was certainly ours to win... but I had a poor session. There were a few interersting boards. Try your hand at these problems. Please leave your answers and thoughts on the hands in the Comments! All problems matchpoints. See the Comments for what happened at the table. LHO opens 1H, partner passes, and righty passes too. What's the lowest value for card Y with which you would double? You're first up. 1NT would be good 14-17. In second seat, you pass (or do you? ), LHO opens 1S, partner overcalls 2D, and RHO passes. What's your call? Your choices are 2H non-forcing, 2S limit raise in diamonds, 2N natural and invitational, 3D natural, or 3H fit-showing. This hand from the first segment of the Buffett Cup, played this morning, interested me. This auction was repeated several times, and, of course, all declarers made at least six. The West hand, in my opinion, is way too good for a 4S call here. Why preempt when you have such an immense hand? Why preempt when you have spades? Couldn't you have a hand more like AQxxxxx x x Qxxx? Does the board-a-match scoring affect your thinking on this hand? Several excellent players made this decision, so I may well be in the wrong here. Would you bid 4S on this? Why? The ACBL holds its annual Instant Matchpoint game tonight. This is a very fun event. The (random) hands are analyzed by Larry Cohen, and each player in tonight's game will receive a booklet with the hands and analyses. This is an unusually scored event-- you're not matchpointed against the other players in your club, but against what Cohen thinks most people will be doing. You'll get your results directly after each hand. Section tops will earn a gold point, and other placings will be half red and half black. National winners will get a writeup in the ACBL Bulletin. Meg and I are playing in this event tonight-- I'll be playing with my friend Marie (with whom I had a great time at the Raleigh, NC Regional this year) and Meg will be with a new (but very strong) partner. So we should have some fun hands to report for you tomorrow! 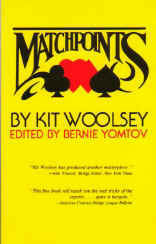 Follow this link to see if a club in your area is offering the Instant Matchpoint Game tonight. Here's the results from last year's IMG. Richard Pavlicek analyzed the deals for the IMG from 1987 to 2006. Here's a link to all twenty years of hands and analyses! Mr. Becker played with Dorothy Hayden in the 1963 International Team Trials. They tied for fourth in the event, just shy of being placed on the USA team in the 1964 World Team Olympiad. Mr. Becker and Mrs. Hayden had a bit of a bidding misunderstanding, but Mr. Becker played the hand majestically. As was standard at the time, Hayden's 3C (jump preference in a minor) was forcing. Mr. Becker made an invitational 4C bid... but Hayden remembered their actual agreement that 4C was Gerber (ace-asking)! She responded 4S (two aces), and when the bidding got back to Mr. Becker, he figured that any partner that bid diamonds, clubs, and spades couldn't have more than one heart-- so he bid the club slam! The diamond queen was cashed (South pitching a heart), and East (Vic Mitchell) was squeezed in a fun way. He couldn't release his spade guard, so he let go a heart honor. Mr. Becker cashed the queen of spades and led the eight of spades. Mitchell split his honors (all later agreed that Mr. Becker certainly would have stuck in the 9 if Mitchell hadn't split) and South won and exited the jack of hearts! If West hopped up with the ace, he would have to lead from the 8-5 of hearts into dummy's T-6 at trick 12, and if he didn't, East would win and have to lead from J-7 of spades into declarer's A-9! A few days ago I put up the post You Be The Judge. We got some great responses. Here's the original hand and the final result of the responses. 2D was an invitational or better raise, all else was natural. Consensus: West's percentage of error: 61%. Worst call: 3D. Thanks for all the responses! I'll know who to turn to next time I have a disaster. Bridge Master 2000 is, in my opinion, the best bridge program out there. It's a declarer play program, with dozens of preloaded hands. There are five skill levels. Level One is challenging for a novice; any reader of this site should breeze through them. Level Three should be tough for most players. Level Five is miserably hard... these are meant to trouble even World Champions. I'll put my favorite Level Five hand at the end of this article. Bridge Base Online offers six sample deals at each of the five Levels. Try it for yourself! Log in to BBO, and click on "Other Bridge Activities". Near the bottom of the list is Bridge Master 2000. Click your preferred level and try the sample hands! You can purchase individual sets of hands on Bridge Base for $10.00 per 30 hands, and you can buy the whole program here for $59.95. The price tag may look steep, but I promise it's worth it. My suggestion would be to play the sample hands on BBO and find your level, then buy two sets of that level and one of the level above that. Then practice! These hands are set up to reward the best lines of play. If you play it and fail, you can try again as many times as you need. Be warned-- the lie of the cards that wreck your first try may not be the same lie when you try again! If you try a different sub-par line of play, you'll get punished for that too. Once South finds out that North holds the black aces, he bounces into 7D. The king of spades is led, and it's your play. I'll post the full play in the Comments. I practiced on Bridge Base Online a few days ago with my friend Paul. 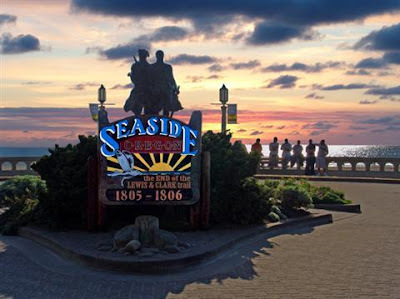 You'll read a lot more about my adventures with Paul later this month-- we're playing the most popular Regional in the Northwest - Seaside, OR - together. Paul and I had some amazing hands and some good practice. All problems IMPs. What happened at the virtual table will appear in the Comments, as always. Am I the only one in the world who would think of 2H here? How about at other colors? 1H (P) 1N [forcing] (P) ? Or would you have opened 1S? Or passed? (1D) X (3D) [weak] ? You pick this up first in hand. Do you open? If not, what do you need to add to the hand to make it worth a one-bid? (a) What was West's percentage of the blame for the final result? (b) What was the single worst call [or play] of the hand? I liked this column a lot. It was discontinued about a decade ago, so I don't feel awful about 'borrowing' the format. By the way, if I haven't said this before, TBW is the one tool that every bridge player needs. 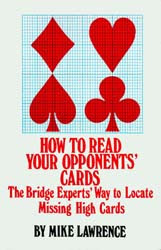 Looking back on my bridge life, the thing that primed my brain for high-level competition and brought my game from middling-intermediate to expert is reading my Bridge World every month cover to cover and reading any back issue I could get my hands on. I was thrilled a few months ago to be able to buy over 100 back issues from the 1950s to the 1980s. Hopefully in a few decades my collection will be filled in. Hardly a night goes by that I don't read at least one back issue in bed before falling asleep. If you don't currently have a subscription, get one. If you already have one, get one for your favorite partner. Playing a strong notrump based system, West opened a natural diamond. East made an invitational or better raise with 2♦. When West rebid 3♦, East bid 3NT and West let it sit. 3NT made 4 on a spade lead. Obviously, 6♦ is laydown unless an opponent has Axxxx of hearts, and would have made at the table, giving E-W some very nice neckwear. As it was, they 'settled' (happily, may I add) for 6th overall in the World IMP Pairs in Verona, Italy, in the summer of 2006. (a) What is West's percentage of the blame? (b) What was the single worst call?